Recovering waste heat using compact heat exchangers is an effective way to increase energy efficiency in both new and existing plants. But not all heat is worth recovering. It all comes down to the possibilities of reusing the energy in an economical way. The first step is to have a Heat Integration Audit performed by an Alfa Laval specialist. The audit investigates possibilities and presents the results in a feasibility report outlining the investment profitability estimate. To find all the potential ways to create value from recovered heat, the energy system of the plant must be analyzed, as well as the processes, the cooling system and surrounding factors. 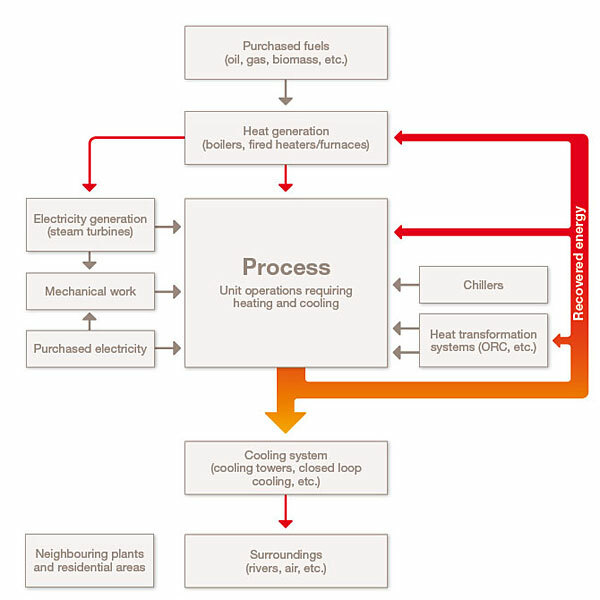 How is process heat generated? Where is the major part of the heat/energy used? What is the optimum load on the boilers/burners? How is electricity generated? Is there any spare capacity in the co-generation systems? Are there constraints in the cooling systems? Are there bottlenecks related to heating or cooling? Are possibilities to sell heat or electricity to neighbours? Below the flow chart shows the basic systems found in most plants and is a good starting point when discussing how to get maximum results from reusing recovered energy.